I chuckled too, but mine was one of those nervous chuckles, knowing how true Maurice’s claim was. Maurice grew up on a dairy farm in central California and transplanted himself to the Hollywood Hills many years ago, teaching yoga, selling raw milk, and (now) designing a line of high-end men’s clothing, Epic62. He and I have been at odds over the years as he sold raw milk and I called for improved information about the risks and benefits of raw milk for new consumers entering the raw milk market. For Maurice’s part, he has always kept it real, acknowledging that raw milk has its risks but also scoffing at the degree of risk to any particular person. He grew up on a dairy farm and has never been zapped by a foodborne pathogen from raw milk. In the spirit of keeping it real, however, Maurice acknowledges more readily now the experiences of parents who have had children sickened in raw milk outbreaks. Maurice’s perspective — that contaminated raw milk is possible and that it’s a worthy topic of discussion — is part of a growing view among raw milk advocates. Indeed, some years back I was one of the few people who both consumed raw milk and publicly called for improved advocacy information for would-be consumers. 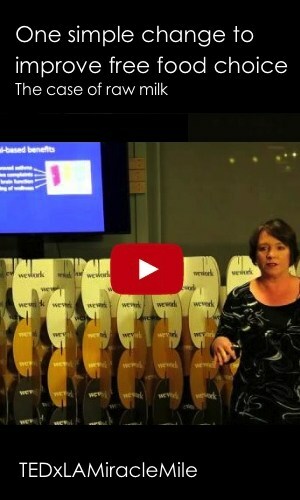 I gave a version of this Hollywood TEDx talk to veterinarians in 2009 and was heckled. A related post (here) I wrote at the Ethicurean website (now on a long hiatus) was the most commented post at that popular website. Nearly a decade ago, raw milk advocates blamed outbreaks on government agents: guys planted pathogens in raw milk to thwart the growing raw milk movement. Raw milk could not possibly contaminated and the “government agent theory” seemed the only possible explanation for a raw milk outbreak. The nation’s leading raw milk advocate group and originator of the government conspiracy claim, the Weston A. Price Foundation, made a major step about four years ago and admitted that contamination was possible. Bloggers followed suit giving readers more tools on selecting clean sources of raw milk, including citing a handbook written by a forward-thinking dairy farmer helping new farmers understand where contamination could happen and how to improve sanitation (a resource probably not deemed necessary back when government agents were the only vector of contamination in raw milk). I weighed in as well offering a guide for raw milk consumers shopping for their own dairies. 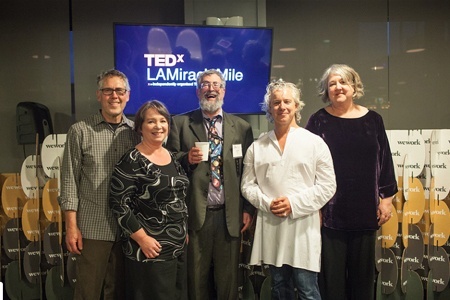 In those same years, Maurice left his work in raw milk, allowing him time for his clothing line and for producing engaging talks for TEDx Miracle Mile. I was flabbergasted when he invited me to speak about raw milk. In fact, his was an open invitation to present what I chose to present on the topic. He did not require vetting the details beforehand. At the January event, Maurice challenged the Hollywood TEDx audience to think carefully about the words we use and their meanings — to understand the words as others are using them so that we can bring clarity to political discussions. Open yourself to be challenged and you will be enriched. And so my apparent political foe allowed me a platform to tell the story you will find in the video below. All of that is just a bit of background on what is likely to be a very obscure topic to readers of FreshBitesDaily.com. We three generations of Roses here at FreshBitesDaily.com spend little time engaging in food politics. However, a core philosophy of ours is that political movements will never succeed if built on a foundation of poor information. Consumers are entitled to information that is as accurate as possible. A healthy advocacy movement is one that embraces that value as well. Thanks to Hollywood technology and, more notably, to the support of one of California’s raw milk leaders, Maurice Kaehler, we bring the talk to you here in Internetland.